I stepped out of the campus where we live, to cross the road and catch a bus. Yes, sounds simple and mundane. But it was not. The city corporation is building a metro, and the road is dug up everywhere with junk strewn helter-skelter and no footpath. I looked up at the sky in exasperation, “What is going on in our country?” My eyes missed the heavens and caught a billboard. 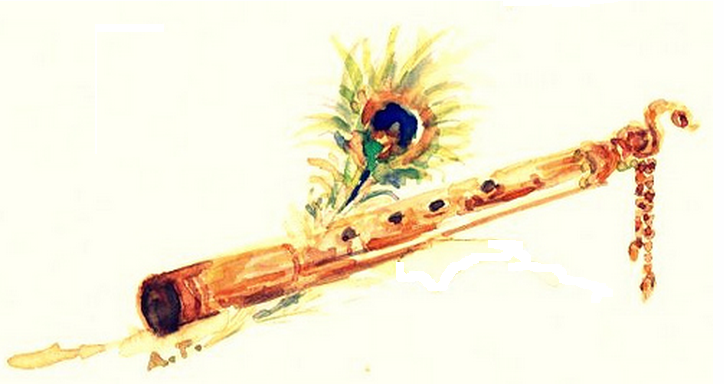 Join “Anand Utsav” – “A Festival of sweet Bliss” it proclaimed. A revered spiritual teacher would be giving discourses on the Gita (a Holy Book in Hinduism) at the end of August. I started smiling thinking of the Gita and my Beloved Lord, the one who gave the Gita to us all. With renewed strength I set off to cross the road, maneuvering adroitly between an auto rickshaw and a motorcycle and then sliding in front of a truck and behind a station wagon. I reached the other side, feeling like a war hero. But the bus, where was it? There were no buses in sight. I turned around vexed and noticed a cloth banner flying at a short distance. “Janmashtami Celebration, Palace Grounds, Bangalore.” It had a wondrous picture of baby Krishna in the middle. I turned around and still no bus. But a feeling of blessedness descended upon me. Blessed to be in a land where God dances in the billboards. wondrous picture of encountering Divinity in the midst of earthly concerns…thank you, sweet Krishnapriya! You are a light to all who read you. Blessings and Love always! The little joys of life :)! Thank You for sharing these snippets which enrich our lives. Ahh.. you also live in Bengaluru!! While others keep complaining about the traffic, you found something that made you happy. Great! It seems your billboards are notably positive, upbeat. I think that’s a good thing, how it should be. Here, it can be a bit different. Sometimes the message is neutral. “Jesus Saves”. But often the message is either subtly or blatantly negative, threatening hellfire, damnation. The further South you go in this country (America) the more that is so. I have no idea why it’s like that here. What possesses people to weaponize religion? I guess it might be an acquired taste, something some people (e.g. Evangelicals) grow up with, think of as normal. But to me it’s a bummer, a downer. Yet at least the signs are laughable too.